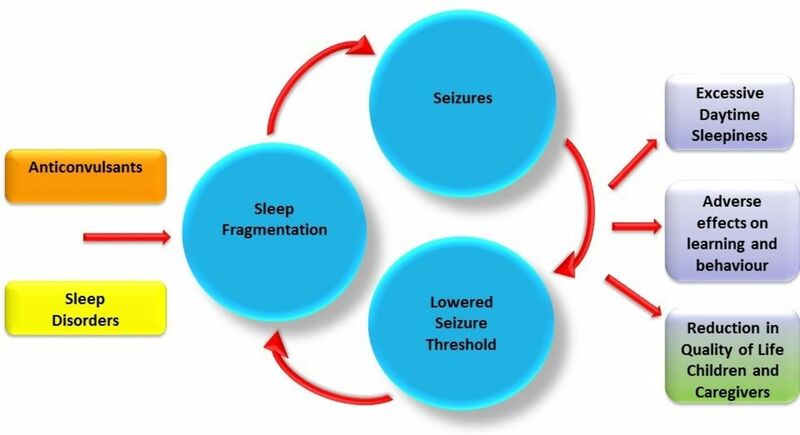 The relationship between sleep and seizure disorders is a particularly vicious cycle. Nocturnal seizures can interrupt sleep while a number of factors, including antiepileptics and sleep disorders that cause sleep fragmentation, can worsen seizures. Understanding and managing seizures and related sleep disturbance is therefore an important and treatable intervention target that could potentially improve children’s sleep, but also their learning, mood, behaviour, seizures and parental quality of life. Seizures and sleep have a bidirectional relationship. Poorer sleep may trigger worse seizure control and vice versa. There are a number of seizure disorders almost exclusively associated with sleep. Epilepsy-specific quality of life is not determined solely by seizures, but rather by factors such as a child’s learning, mental health, sleep and social support. Increasing consultation with all stakeholders is improving awareness of important treatment targets. Antiepileptic drugs, as well as other non-pharmacological epilepsy interventions can all affect sleep quality. Parent-led behavioural sleep interventions are underused and have potential to improve sleep of children and their families. Our son’s seizures began out of the blue. There was no warning, I was downstairs when his dad called me. Our first thoughts were that he was having a stroke—his mouth dropped only on one side and only one side of his body was affected. We thought he was dying. We called the ambulance and he stayed in hospital overnight. We waited a week and were then told they thought he had something called benign rolandic epilepsy. It is not a helpful name as we don’t think anything about it is benign. In one 5-month period, he had 11 seizures from his sleep. Many have been so severe we have needed to call the ambulance to take him to the accident and emergency department which is very stressful. In fact, he has had a good period with no seizures now for a few months that we hope will continue. There seems to be so much that people do not know. We needed to know about the future, but all the professionals could tell us is ‘he may never have another seizure, or he may have one every day—we don’t know’. ‘It’s just a matter of wait and see’. For us that was unbearable. We were living on eggshells in anticipation. In the end, we decided the only way we could cope as a family was to let him co-sleep with his dad. I now sleep in his bed. It’s not ideal, we know, but it’s the only way that we can keep an eye on him. We also know that if he sleeps badly his seizures may be worse and so at least this way we all get a good night’s sleep. We’ve been told that the seizures don’t cause him damage unless they are very prolonged but that is hard to believe when you see him have one. Our professionals have discussed about antiepileptic drugs. Again, there were no definite answers and they said “they were there if we wanted it”. We though a lot about the pros and the cons and decided the risk of side effects were too great. He is happy and intelligent, doing well at school and we didn’t want to change any of that. Anyway, his seizures have stopped on their own for the time being; if he was on medicines we would have thought it was due to them and had to carry on giving them. No one has ever discussed with us how this affects his sleep and our sleep. No one has asked about our sleeping arrangement. We have had the best support from facebook groups where at least we know other people are going through the same thing. We know there are special mattresses and that we could use CCTV but we would still have to stay awake to look at them all night. We don’t want him sharing a bed with his dad forever. In the future, if we are more confident about his seizures stopping, we will think about how to get him back to his room. It’s hard though, I can’t imagine ever not worrying, even when he grows up. The interactions between epilepsy, antiepileptic drugs (AEDs), sleep and learning8 are summarised in figure 1. Sleep and epilepsy—a vicious cycle. Children’s sleep passes through different sleep stages conventionally divided into rapid eye movement (REM) and non-REM (NREM) sleep. NREM sleep coordinates electrical brain activity into important slow oscillation and faster bursts called spindles. Sleep research suggests that this slow wave synchrony and spindle activity contribute to the rejuvenation of synapses and overnight learning. Unfortunately, it also results in a vulnerable landscape, primed to allow easy and rapid generation of seizure activity. Within this difficult vicious cycle, sleep disturbance, therefore, is a pivotal target of intervention that could potentially improve child sleep, but also learning, mood, behaviour, seizures, and parental quality of life. One metaphor is to consider sleep in epilepsy as ‘deep sea diving’, the most dangerous times are during the initial dive and then on surfacing. A number of reviews describe a range of epilepsies that are strongly associated with sleep.18 The most striking example of this is the syndrome of electrical status epilepticus during slow sleep (ESES)/continuous spike-wave discharges during sleep (CSWS), an epileptic encephalopathy with behavioural and cognitive deficits, various seizures and continuous spike-wave activity occurring during NREM sleep. Benign epilepsy with centrotemporal spikes or rolandic epilepsy (RE) is the most common childhood epilepsy. The centrotemporal spike-wave discharges in these epilepsies are activated in sleep, and the focal nature of the seizures (eg, a tingling feeling in the tongue, dysarthria and hemiparesis) means they can be confused with parasomnias if there is no history of secondary generalisation. Genetic generalised epilepsies such as juvenile myoclonic epilepsy (JME) are sensitive to sleep disturbance and characteristically present with seizures after awakening. In both structural and genetic frontal epilepsies, there are typically multiple episodes from sleep every night which may initially be difficult to identify as seizures. Parents may not witness their children’s focal onset of a frontal seizure and so miss the characteristic ‘fencing’ posture with head turning. Autosomal dominant nocturnal frontal lobe epilepsy (ADNFLE) is an example of a ‘genetic focal epilepsy’ and can be caused by mutations in a gene coding for acetyl choline receptor subunits. Seizures in ADNFLE may be typically frontal but also may take the form of nightmares, parasomnias and sleepwalking. Patients identify cognitive side effects of AEDs as their most important health issue.24 The available evidence in adults suggests that all AEDs adversely affect learning, older AEDs more than newer.25–27 So far, there have been no randomised trials in children that either assess learning or compare the outcomes of treatment versus no treatment in terms relevant to parents and children. This review commented that NREM (slow wave sleep (SWS)), for example, is increased by carbamazepine, pregabalin and gabapentin but is reduced by levetiracetam. REM sleep is enhanced by gabapentin but reduced by phenobarbital and levetiracetam. Unfortunately, many AEDs including phenobarbitone, sodium valproate and higher-dose levetiracetam may cause daytime sleepiness. Several antiepileptic drugs (AEDs) are associated with weight gain such as gabapentin, pregabalin, valproic acid and vigabatrin and to some extent carbamazepine and this can independently increase the risk of conditions such as obstructive sleep apnoea (OSA). VNS is used to treat certain refractory epilepsies. Some studies have shown that it can increase the percentage of SWS and reduce daytime sleepiness, although they did not analyse its effects on sleep independent of improved seizure frequency.31 32 It is important to remember that due probably to central and peripheral mechanisms VNS can increase the risk of OSA syndrome (OSAS). It is thought that the presence of OSA itself may exacerbate epilepsy. The potential mechanisms are thought to be via changes in sleep architecture, sleep deprivation or hypoxia. In this way, another vicious cycle is seen whereby epilepsy may increase prevalence of OSA, and OSA may worsen epilepsy. Encouragingly, breaking this cycle seems possible and in adults treating the OSAS with positive airways pressure therapy has been reported to lead to a reduction in their seizure frequency. Parent-based sleep (PBS) interventions are effective in randomised controlled trials for typically developing (TD) younger children, attention-deficit hyperactivity disorder and autism populations35–37 and could easily be modified for children with epilepsy. Many of the same sleep problems experienced by children with epilepsy are commonly seen in TD children and the same sleep interventions are effective in both TD and neurodevelopmental disorder populations.35 36 PBS interventions may therefore be effective in children with epilepsy. However, a ‘one-size-fits-all’ approach to behavioural management of child sleep problems fails to acknowledge additional relevant factors for a child with epilepsy (eg, nocturnal seizures, anxiety about seizures, anxiety about sudden unexpected death in epilepsy (SUDEP)) and their parents (eg, concerns about the appropriateness of using some behavioural techniques with a child who might have seizures) and therefore may disenfranchise parents. A recent sleep and seizure Delphi core outcome study has started to prioritise the sleep and seizure outcomes that matter most for parents and professionals.38 39 Acknowledging and addressing these needs and concerns needs to explicitly form part of any behavioural intervention delivery as is the case with the current CASTLE e-learning sleepmodule http://castlestudy.org.uk/castle-projects/sleep-intervention/. Integrating SUDEP evidence-based advice into any sleep programme is challenging and the content needs to be developed with parents and professional groups in tandem. Generalised tonic–clonic seizures are clear risk factors for SUDEP, but nocturnal seizures may also increase the risk.40 These findings, in conjunction with the observation that postictal respiratory depression is a major mechanism in SUDEP, suggest that unwitnessed nocturnal seizures and postictal respiratory depression can cause SUDEP. Epidemiological studies showed that the presence of another individual at least 10 years of age and of normal intelligence in the bedroom was associated with a decreased SUDEP risk.40 These results might imply that a bedroom observer could detect seizures, check on the child and provide sufficient stimulation to prevent respiratory arrest, although this association does not prove that these interventions directly treat the mechanism that causes SUDEP. There are considerable concerns about the burden of such monitoring on caregivers and the degree on intrusiveness for the young person. Such pressure on parents to co-sleep can trigger inappropriate sleep associations that are often the beginning of more pervasive sleep difficulties. An intermediate step can be to use a listening device (baby monitor with or without video signal) to allow remote monitoring. The evidence for this is, however, weak. There are many emerging studies across different domains with potential to help parents and professionals better understand and manage sleep and seizures in children. Delphi studies involving all stakeholders are starting to allow consensus around the core sleep and seizure outcomes that matter most to young people, their parents and professionals. These need to be routinely incorporated in all future sleep and epilepsy intervention studies. For many such studies, where there is equipoise about treatment options, a ‘no-treatment’ arm is essential. While high-tech body worn devices might soon allow accurate monitoring and management of sleep and seizure disorder, at present they lack the necessary precision, and their effectiveness needs proper testing in varied patient groups to avoid the consequences of either false reassurance or missing true events. In the interim, there are ‘low-tech’ solutions involving evidence-based parent-led sleep interventions that are underused and have the potential to improve sleep of affected children and their carers and enable a virtuous cycle of sleep and seizures. Contributors PG conceived the content of the review. PG and FMG contributed to writing the review. EM wrote the parent account that begins the whole review and read and checked the rest of the review. Funding Professor Gringras and Dr Gibbon are investigators on the Changing Agendas in Sleep and Treatment in Childhood Epilepsy (CASTLE) Project— independent research funded by the National Institute for Health Research (NIHR) under its Programme Grants for Applied Research Programme (RP-PG-0615-20007). The views expressed are those of the authors and not necessarily those of the NHS, the NIHR or the Department of Health.